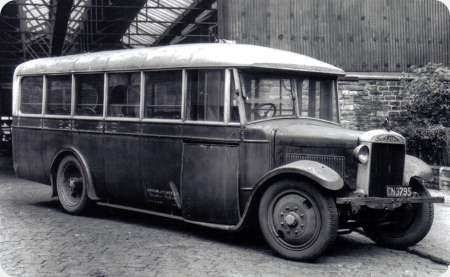 This Gilford SD, chassis number 10561 was new to Mason, Gateshead in January 1929 but passed only six months later to Barlow & Fisher of Gleadless, Sheffield. At that time, Gleadless was at the outer edge of Sheffield on the Yorkshire/Derbyshire border. This photo must be immediately after Sheffield Corporation took over the business of Barlow & Fisher in 1933 as it is outside the Corporation’s Bramall Lane garage but still showing Barlow & Fisher as legal owner. Sheffield sold it in August of the same year. I wonder where it went and why its stays at Mason and again at Sheffield were so short? Incidentally, the PSV Circle’s Gilford book suggests that it might have been a demonstrator before going to Mason. One further question – can anyone identify the body-maker? Perhaps Wycombe, as many Gilfords were? This is a Gilford SD, not an OT, and there would be a number in front of the designation. In Gilford terminology, OT meant "over-type", i.e. forward control. This one is normal control, or "standard drive" in Gilford’s description. The figures denoted the wheelbase, and the popular ones were 15 (15 feet), 166 (16 ft 6 ins) or 168 (16 ft 8 ins). The length of this one could possibly be a fifteen footer, making it a 15SD type, but I stand to be corrected by those who can track down the individual buses on this site. Thanks Michael I have edited the title and copy, will wait for the number. Thanks for the info Michael. I am no expert so I took the detail from the PSV Circle MM5 book. Clearly this will need amendment if and when reprinted. Any advice on the bodybuilder? I see no sign of Gruss Springs on this vehicle, but there is a leaf spring end, plus shackle just poking out in front of the offside front wheel. Were these a slightly later development, or were they only put on some models? Bramall lane Garage opened in 1926. I always thought (in the 1950s) their depot was Coal Aston, (on the Sheffield/Derbyshire border), or Station Road, Halfway more likely, (also on the border). In the 1930s, Gleadless was not on the border, Woodseats & then Meadowhead was, (border past the STD sports ground, (Four Lane Ends), just before Low Edges Road was built. Not sure exactly where the Barlow and Fisher depot was, but in the 1930s Gleadless certainly was on the Sheffield/Derbyshire border – the next village was Ridgeway, which was in Derbyshire. I think there is some confusion with Booth and Fisher, who’s depot was originally Killamarsh and then Halfway, and who ran through Coal Aston. Barlow and Fisher ran the Sheffield to Chesterfield route via Gleadless, Ridgeway and Ford, so Gleadless would have been an appropriate base. When they were taken over jointly by Sheffield and East Midland, the route became the 99. Maybe it’s just about to be taken away for scrapping. It looks as if it has just been pushed out of the garage & left where it stopped with front wheel against the kerb. Also the front panel seems to be completely detached. I am currently helping with the restoration of 168SD WX 3567 and have gathered quite a lot of knowledge on Gilfords through that. I notice that there appears to be no nearside headlamp, either. Is WX 3567 the Gilford I saw at Carlton Colville a few years ago, Brian? Registration looks like CN 3795 – an impressive looking machine indeed, even if a little "faded" or jaded. The Motor Transport Yearbook for 1929 gives Barlow and Fisher as a company registered 24th July 1929 at Ford, Ridgeway, Derbyshire, but with registered office at Brierley House, Gleadless, Sheffield. The directors were A D Fisher, W H Barker and J F Skelton. Booth and Fisher is not listed at that time (nor is Joseph Booth) – Booth’s partnership with Donald Fisher appears to date from the mid 1930s, although the limited company of that name was only formed much later. Gilford used the Gruss air springs on the 168SD and the 168OT from late 1929, the Front Wheel Drive prototypes also had them but the Zeus and Hera did not, as this is either a 15SD or a 166SD it was built without them. As far as I can see the other OEMs users of the Gruss equipment in the UK were Albion with the AM463 RAF ambulance and Crossley with the IGL8 Indian Army lorry. Chris, apologies for the delay in replying to your question, don’t look at the site very often. Yes you are quite correct, WX 3567 is currently being restored at East Anglia Transport Museum, Carlton Colville.